"The last man on Earth sat alone in a room. There was a knock on the door." A new crop of writers emerged from the dawning of the nuclear age, grappling with humankind's place in the universe. While imagining the wonders of space exploration and the rise of technological advancements, they questioned whether we were prepared to encounter aliens, or even control the machines and weapons we'd built ourselves. 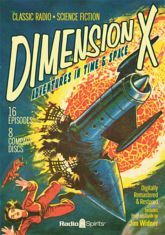 These first episodes of the Dimension X series - including stories by Kurt Vonnegut, Robert Bloch, and Robert Heinlein - feature performances by Staats Cotsworth, Raymond Edward Johnson, Les Damon, Bill Lipton, Berry Kroeger, Jan Miner, Joan Alexander, Joe DeSantis, Santos Ortega, and more.